As early as the 17th century, European writing has described Native American basketry. The word "basket" was used loosely to describe any bag, basket or container, which opens from the top. 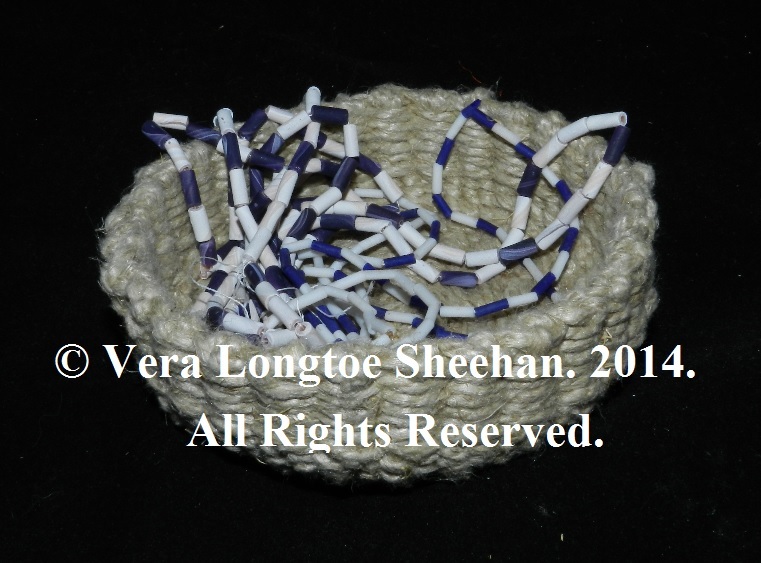 Vera Longtoe Sheehan continues this tradition of her ancestors. She harvests and processes into cordage milkweed, nettles, dogbane, for twining baskets & bags. 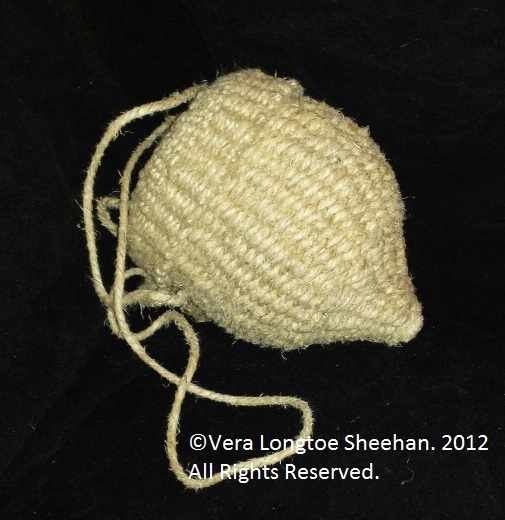 She also twines with hemp, jute, cotton and linen cordage. 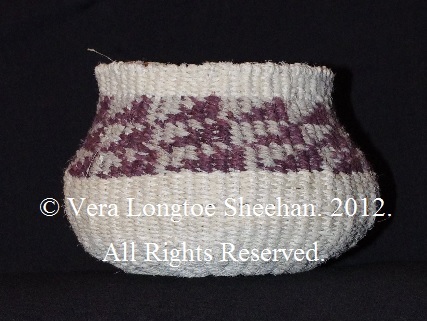 Twined basket painted with red ochre. Created for the Northeast Woodland Fiber Arts exhibit. Now In the permanent collection of Mt. Kearsarge Indian Museum, Warner, NH. See Exhibit page. This huge twined round twined bag can be used as a pack basket or storage container. Its heavy-duty construction will last for many years. Currently on exhibit at The Institute for American Indian Studies. Previously exhibited at the Boston Children's Museum and McDonnel-Williamson House. Now in the permanent collection of the Lake Champlain Maritime Museum, Vergennes, VT. 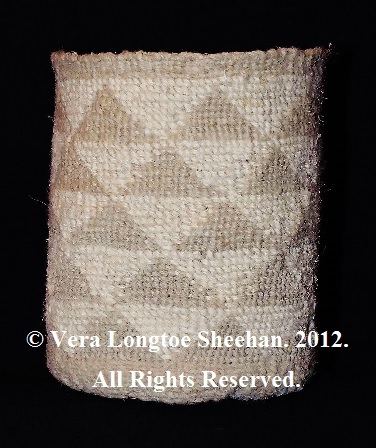 Round twined basket with symmetrical triangle, geometric pattern. Made with 2 shades of natural Previously exhibited at Mt Kearsarge Indian Museum and McDonnel-Williamson House. 5" wide x 6" tall. Geometric pattern on closed twined baskets. Great size for a trinket basket Previously exhibited at McDonnel-Williamson House. Made from natural and dyed hemp. Approximately 6" wide. Natural hemp, adorned a with red stripes. Previously exhibited at the McDonnel-Williamson House and Institute for American Indian Studies. 5" wide x 6" tall. cut off. This shape lends itself nicely as a sewing basket. Previously exhibited at the Boston Children's Museum and McDonnel-Williamson House. Natural and walnut dyed hemp. 6" x 4" tall. Great container to help you hold your provisions and a tight fitting lid. Previously exhibited es and McDonnel-Williamson House and Institute for American Indian Studies. 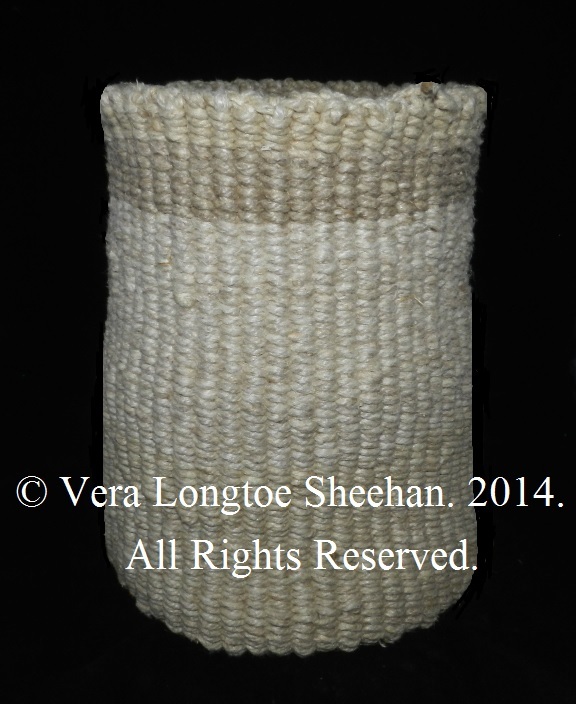 Natural hemp, with triple red stripe 6" wide x 7" tall. A traditional seed collecting storage container used by Abenaki families in the Connecticut River Valley. Re-created based on oral tradition/witness account from the 1930's. After filling it, it would be hung until it was needed to plant next summer's garden, Previously exhibited es and McDonnel-Williamson House . Natural hemp. 6" x 8" tall. In 1674 Daniel Gookin* described Native American baskets in New England, as follows, "From the tree where the bark grows, they make several sorts of baskets, great and small. Some will hold four bushels, or more; and so downward to a pint. In their baskets they put their provisions. Some of their baskets are made of rushes; some, of bents; others, of maize husks; others, a kind of silk grass; others, of a kind of wild hemp; and some, of barks of trees; many of them, very neat and artificial, with the portraitures of birds, beats, fishes and flowers, upon them in colors." [Gookin 1970: 16] . *Daniel Gookin was a settler in Massachucetts and wrote extensively about Native Americans.